Living So Abundantly shares how by patiently holding onto her $2/1 and $3/1 Target Women’s Top coupons, she was able to get five shirts for just $5.46 total. I kind of feel badly because I got a little impatient and used my coupons to buy shirts for $3.60 each. Oh well! Note: These coupons are no longer available. Target clothing coupons go quickly and often result in great deals, so I recommend printing them as soon as they become available. I signed up for text coupons too, and at least once a month, they throw a clothes coupon in. It’s only good for the week, but they’re 2-5$ off house brands. That blue shirt with the butterfly is super pretty. Okay, honestly, where do you FIND these coupons? I never see coupons for Target. Thank you! They are on Target.com. I post the good ones as they become available. google target coupons and you’ll be able to find them faster. I think you have to instal some printer software but its harmless. I spent more with mine, but I was needing dress shirts for work, and those don’t really get down to the $2-$3 range. But I saved $5 when I bought two dress shirts! I’ll call that a success! Target has some really great deals with some of their coupon match-ups, especially with stuff you don’t normally get coupons for like clothing. I bought two shirts for 50 cents each using the $2 coupons. (They were on clearance for $2.50). I need to go back and use the $3 off coupon. 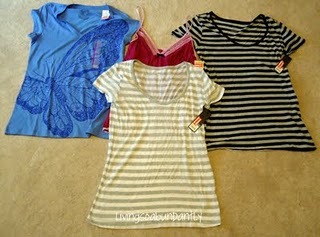 I found shirts on clearance for 2.50 and ended up spending $2 for 4 shirts! I was soooo excited! I scored huge! I got 8 shirts for $1.59 today at Target with my coupons!!! I used mine to get one sweater dress, one tshirt, and 1 hoodie for $5.96!! I was so excited to get Mossimo dress pants for less than $3 with coupon. The Mossimo coupon simply said women’s apparel item–didn’t have to be a top. I went in with the intention to pick up a few tees to use as pajama tops but ended up with a really nice pair of pants, and I’m plus size so those are even harder to come by. I was so psyched!! I love, love, love Target! And I paid $1 for a hoodie! I bought my first swimsuit cover-up ever. WOW! What a fabulous score for about $4 instant gratification! I HATE wearing a swimsuit in public! GAH! I didn’t get to print the coupons in time. But I went and got some stuff on clearance anyway. I still think $5 for a top isn’t bad. I also got a summer dress for $6. I just try to pretend I didn’t know there were coupons out. I think $5 is great for a top. That is my purchase price for most tops but it depends on the top too. I managed to score free jeans from Target with the $5 ladies denim coupon and two maternity tees for $1 a piece when the Liz Lange coupons wee available. I love that! Oh and let’s not forget free socks with the $1 off Circo coupons!! Thanks MSM!!! Great! I hold onto my clothes coupons and other sale items till something worthwhile comes along. I use these kind of deals to get clothes or things we really need. I saved all my clothes coupons and went shopping one day and got some good deals! I am at home in the summer so I want to look nice but don’t have to look professional like I normally do! how often do target coupons reload? is it weekly? Once a week, at least. Sometimes more. I have already told my story but here is what I did with my Target clothes coupons and other ones I had. I went shopping and got: 2 free tops at Target, one for 75 cents, one for a dollar and a tank and top for $2; then got 2 tops at Old Navy for 50% off about $5 each, 3 pairs of shorts and 2 capri pants at Walmart for $10 using $5/1 coupons, a sun dress at Kohl’s using a $10/10 for about $10 (original $40); already had 5 tanks (brand new) I got for $2/item from Old Navy last year I forgot I had, had a GC and got a top and pants OOP $0. I have lost weight so needed new summer clothes. This is enough to get me through the summer. Two tops are long sleeved so I can wear into the fall and for right now where it is cool. I tried to get black bottoms and different tops to got with them. I can spruce things up with accessories. My minimal wardrobe :). I buy ahead on clothes as well as groceries. I went to JC Penny last night and did not find anything I liked for me but found 2 summer tops and 5 Back to School tops for my young teen and pre-teen. OOP $25. I already had 2 pair of jeans for my older daughter who is more particular. She goes to a new school next year so I wanted her to have some contemporary clothes. I have undergarments for all the kids as well. When I find clothes at a really good deal, I will hunt for other clearance or inexpensive items to go with it. Then I may add accessories to add. Usually I can make a pretty nice outfit for a child at minimal cost for a birthday and/or Xmas. I got 2 $10/10 coupons from Kohls in the mail. I am buying for back to school clothes now. Don’t you think there is a fine line between both things? If you wait it out…the ones you like best might not be there anymore…so pay a bit more, like them more maybe?? that target coupon for clothes is not expired by now? I have mine, last time the cashier wouldn’t take em, it wouldn’t scan, but I can try again if they are still valid. I thought they have an expiration date.